The artisan coffee brewer uses Dropbox Business to manage all aspects of its business, from collaborating on beverage recipes to managing finances. To cater to today’s coffee-crazed public, many artisan coffee companies are increasingly sourcing the finest beans and roasting them in house. But as Hamid Rafati sees it, too few focus on the actual brewing process, meaning the customer often ends up with a mediocre beverage. 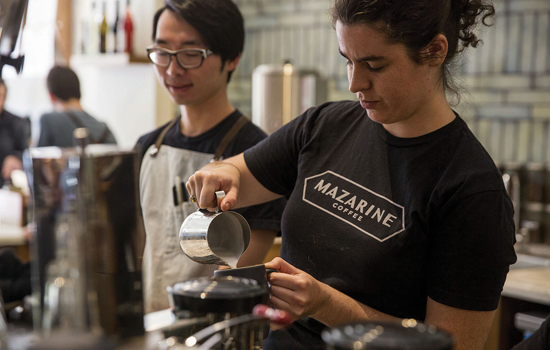 Rafati plans to change all that with Mazarine Coffee, concentrating instead on developing recipes and training staff to prepare the perfect cup of joe. “That way we can actually be the experts in making that coffee,” says Rafati. The former design engineer wanted to create a collaborative environment for employees that would lead to a new kind of coffee experience in San Francisco. He concluded that relying on email to share recipes and other files with his staff would quickly lead to confusion over who had the latest version. Having already used Dropbox to store and share personal files, Rafati decided to roll out the solution’s business version for his small business. “Once I founded Mazarine, I realized I could get a business version of it so all of us employees could have access,” he says.